After watching the snowstorm of the season blow into his neighborhood, a young boy wakes to find his town literally buried beneath a mountain of snow. Possibly stuck inside his house for the rest of the winter, survival questions of every shape and size race through his mind- including one that tugs at his thoughts to the very end of his adventure. 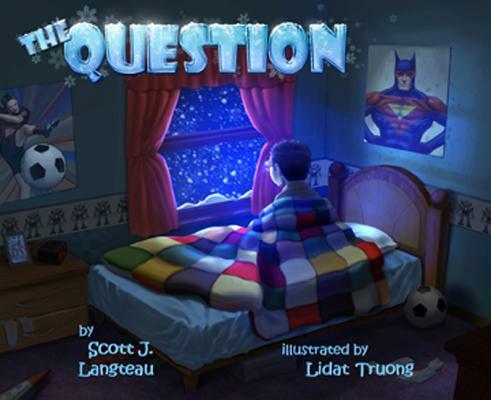 The Question is a wild journey through the mind of a child, with an ending so honestly relatable, you can't help but smile. Growing up in the snowy, one traffic signal (but thousands of cows) small town of Seymour, Wisconsin, playtime came ready-made with Scott J. Langteau's eleven brothers and sisters. He has degrees in theater from the University of Wisconsin and Villanova University. In Los Angeles, he has worked as an actor, writer, and producer for nearly twenty years. Best known for his work on the acclaimed Medal of Honor and Call of Duty game franchises, Scott has worked for the likes of DreamWorks, the Jim Henson Company, and Disney/Pixar. Growing up in Southern California, Lidat Truong has been drawing since he was just a little kid watching animals at the zoo. After a few years at University of California-Irvine, he enrolled at Art Center College of Design in Pasadena, from which he graduated in 2007. Since then, he has provided a wide variety of concept art, storyboards, and illustrations for companies like Disney, Sony, and Vivendi Universal.